The Directorate General of Health Services (DGHS), the implementation agency of the Ministry of Health and Family Welfare of Bangladesh, is moving forward to provide universal health coverage in its literal meaning for over 160 million people through its national health programme. As health systems of the country evolved, care delivery has become fragmented across the various points of service, making it hard for data to be harmonized, for healthcare personnel to share information and knowledge, and also collaborate while providing care. The existence of incongruent health information has appeared as one of the major blockers in the nation’s ability to provide healthcare to every citizen. The successful launch of life-time health records in Kaliganj Upazila of Gazipur district is a milestone for health service history in Bangladesh. The partnership with ThoughtWorks and UKAID is enabling our vision to scale the shared health record platform nationally. To understand the criticality of the HIE, consider the way the Bangladeshi healthcare system is organized - 80 percent of the healthcare in publicly provided health systems is administered by Community Healthcare Workers (CHW) who operate at the community clinics and domiciliary levels. Without a well-integrated system starting from the community health worker, community clinics, a 31-50-bed primary care hospital at the sub-district level, a 100-250-bed secondary care hospital at the district level, and a tertiary care super-specialized hospital at the regional level and cities, information cannot flow for effective healthcare management. The HIE can remove this data flow barrier. Doctors, researchers, practitioners and community health workers get essential clinical decision support from the HIE. On the other hand, administrators can review utilization reports and analyze data to improve efficiency and for process optimization. From a public health reporting or policy formulation standpoint, by accessing the HIE, the ministry can aggregate patients’ clinical data to understand trends within a region and shape health policies at the national level, thus improving the state of health care for the entire country. Building this huge system meant grappling with a huge patient base, complex moving parts, diverse systems and a plethora of vendors. How did we tackle these challenges? The ThoughtWorks team collaborated with numerous application vendors, departments of the Ministry of Health and medical facilities, in partnership with UKAID, to form a shared goal and create the HIE platform. To do this, ThoughtWorks built the Shared Health Record (SHR) system, core to patient care. When a patient’s clinical information is captured by a healthcare provider at any point of care, it is synced to the central SHR system. The SHR processes and aggregates information before submitting to the national reporting and analysis systems. 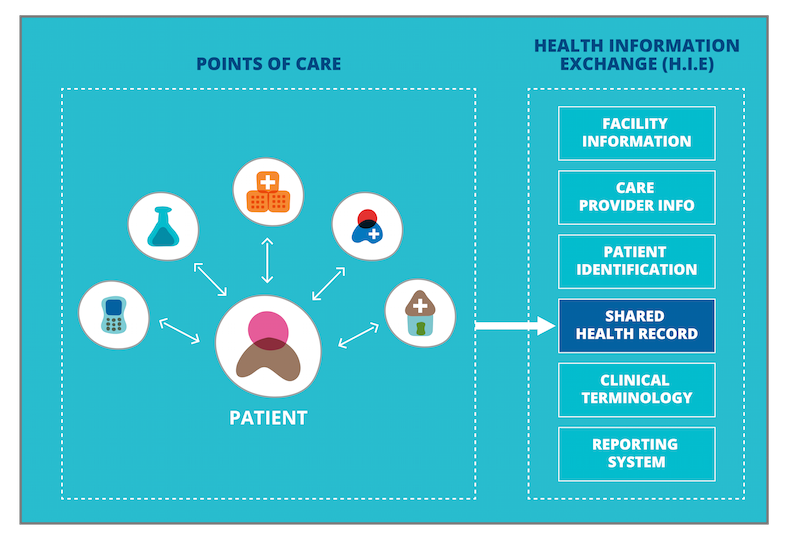 One of the main thrusts of SHR is that any system will be able to integrate with it using global standard interfaces, creating a seamless system for which any provider can access a patient record, regardless of their provider’s location (within Bangladesh) or designation (public, private, faith-based, CHW, etc). While the DGHS already had a few existing systems, there was a need for the development team to build other essential systems. The team created a patient identification system and a clinical terminology management system, which was integrated with DGHS’s existing system. Using standards and techniques from OpenHIE, the team built a custom and interoperable HIE platform, consisting of interconnected systems and tools. A remarkable aspect of the HIE is that it is agnostic of the point of care systems that are already in place, and it ensures integration of all systems. For example, the team is collaborating with an open source community clinic application provider to integrate it with the HIE. While building the systems, the team factored in challenges that come with a low resource setting. This included availability of electricity, internet connectivity, hardware and human resource limitations. The cost to build the HIE had to be at a minimum, while allowing for scale, expansion and interoperability in the future. Since care providers communicate and operate in Bangla, the local language, it also had to be language sensitive. The team successfully launched a pilot at Kaliganj sub-district in November 2015 and in Gazipur district in March 2016 to test feasibility and to identify environmental and system challenges. Currently, Bahmni, a ThoughtWorks-developed distribution of OpenMRS, is being used as the clinical system at sub-district and district hospitals, and as a cloud-hosted CHW application at community clinics. 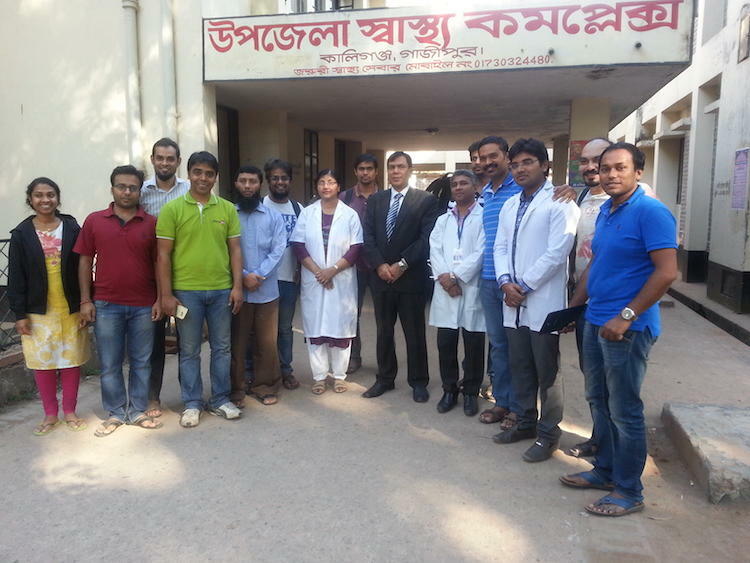 This special distribution of OpenMRS is popularly called OpenMRS+ in Bangladesh health systems as it is a total hospital management solution incorporating OpenMRS and others. ThoughtWorks will continue partnering with DGHS to scale this integrated platform across Bangladesh, thus using DGHS’ noble vision to not only improve Bangladesh’s healthcare system, but also to serve as an inspiration to other countries around the world, where both Bangladesh and ThoughtWorks, will be pleased to share their experience.